I love a holiday, a great excuse to wear something frothy, frilly, and vintage. I've been rather lazy the past several holidays, though, not wanting to shimmy into the underpinnings required to wear a well-fitted vintage dress, and then eat my own body-weight. It's the most delicious peachy color, made from crepe, and oh so fluttery. It has a wonderfully deco rhinestone buckle on the belt, butterfly sleeves, and thanks to its bias cut, slips on over the head and hugs every curve in a very flattering way. No thanks to the bias cut, though, and the material, this dress needs some very specific underpinnings that I don't have. I wore my Rago all-in-one with a vintage slip over the top and I still had visible lines and texture from the Rago shaper coming through in very unflattering ways. I've had this problem with other vintage dresses too, most notably a 1920s chiffon number that seemed impossible to wear. So naturally I came home and began researching 1930s underpinnings, looking at both what they wore back then, and what was available now. Perhaps it's one of the What Katie Did corselettes, and I'd love to try one, but they're a bit out of my price range at the moment, though I may find that, like corsets, you get what you pay for. I did end up purchasing a Flexees Wear-Your-Own Bra Full Slip, which claims to provide tummy, waist, and back shaping, and appears to be long enough to get the smooth hip line needed for 1930s. It was on sale and I like the option to wear your own bra, so we'll see how this looks under those finicky vintage dresses! I do love me some old lady catalogs. I get the National catalog in the mail regularly, and thank goodness. The shop I bought the shaping slip thing from is one of those old lady stores. What a beautiful dress! (and lovely shoes of course!) I have only just started investing in some What Katie Did myself, I started with their back-seam pantyhose and I have been really impressed with the quality. I too dream of buying one of their corselettes one day! I tried a What Katie Did torsolette but found I was too tall (at 5'8") for it to lay smoothly - the 1/4" spiral steel bones lay strangely if the fit isn't perfect. I switched it out for separates and that works better for me. Hrm, good tip. I think the shapewear thing must be highly personal. For instance, separates are working for you, but are hellish to wear for me, or maybe I just haven't found the right thing yet...onward! I too have tried the Rago and found it terribly uncomfortable. Thanks for the other suggestions! That dress look lovely on you. I'm glad you found an occasion to wear it. That dress looks lovely! 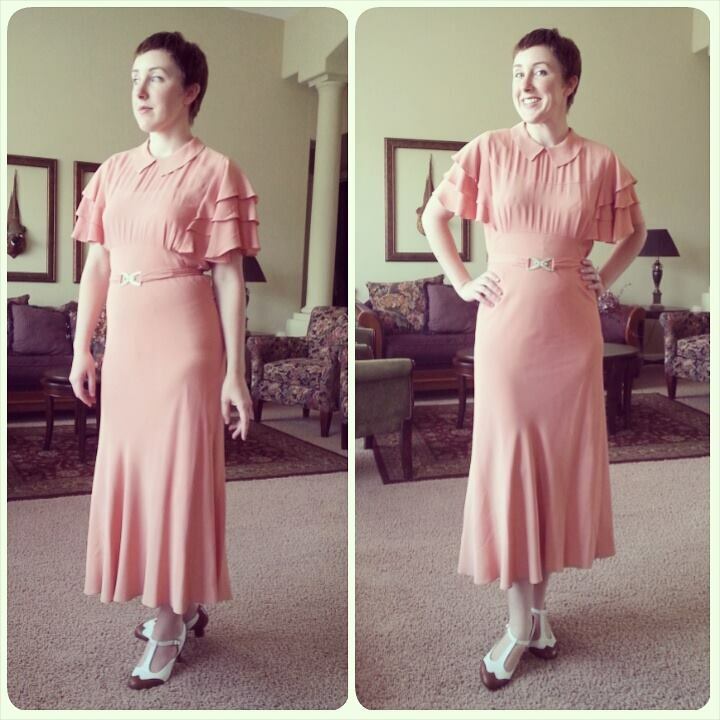 I have yet to find a way to wear 1930's looks successfully, so it helps to see it on other people. About the shapewear... I have tried some of the What Katie Did corselettes on in their London store (they didn't work for me because my waist-to-hip ratio is a bit too much) and I always thought of those as a 1950's style. The surfaces aren't absolutely smooth so you may still have issues with a bias cut dress and I think WKD makes a much better 1930's breast shape in its 1930's/40's bras. Of course, finding the right shapewear for a dress like this is made more difficult by the fact that there is no trend for 1930's underpinnings at the moment, so you are unlikely to find something that's a dead ringer for the real thing. All things considered, I guess a modern item of seamless compression shape wear which allows you to wear your own bra might be the best option. Good to know. I completely agree with you. '30s underpinnings are out at the moment (will they ever come back? probably not...), so I'll either have to make do with something kinda-sorta, or make my own, which is where I am afraid this might end up! I have a "shaper" with a side zipper and garters, but it only goes to the waist, and it is waaaay too tight for my size 10 self, let alone my size 12self... If you look at those old May West and Carole Lombard movies, they were wearing something, and it wasn't seamless, tho I occasionally suspect Carole was naked under hers!! Kiss Me Deadly make very high quality products, and this is their best-selling piece of shapewear. I covet it. I have a similar wear-your-own-bra one and it is my most-used foundation garment. It does the job, is a great place to clip garter clips (from Sock Dreams), and I can change the shape easily by wearing a different bra or slip. I got mine on clearance years ago and it has really held up. Lauren; your dress is gorgeous! And thanks for bringing up this issue with underpinnings. I, too, have the body shaper (w/crotch) from Rago. I like the support around the midsection, but it does funny(not in a good way) things to my derrière, is very uncomfortable "down below" and itches in the cup-department. I am now armed with some additional info that hopefully will help me find something more suitable. This is really a trial and error kind of thing, and like you said, very individual. Id definitely recommend you try out What Katie Did's corsets, they are great and I have them #1 on my review list.